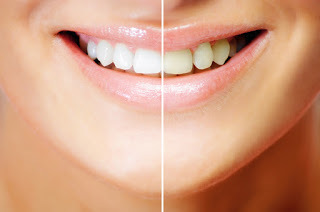 One of the most popular cosmetic dentistry services available today is teeth whitening. With this effective service, Dr. Folck and Dr. Santos can help patients improve the appearance of stained teeth and enjoy a more dazzling smile. But first, why do teeth darken in the first place? Tobacco use and some medications also contribute, as does aging. But with Zoom! Whitening, patients can enjoy a whiter, more attractive smile after just a single visit with our Virginia Beach cosmetic dentists. How much whiter? By as much as 10 shades. Here’s what you can expect from your whitening appointment. First, your Virginia Beach cosmetic dentists will look at your teeth and gums to see if whitening is right for you. If it is, we’ll make sure you’re comfortable, then place a protective covering over your lips and gums. The special Zoom! Whitening gel will be applied to teeth and activated by a low-heat lamp. The gel will penetrate beneath the enamel and work on the stains you want to get rid of. The entire process only takes one hour. Do you want to learn more about teeth whitening? Call Smile by Design in Virginia Beach for a consultation visit.